This jewel is tucked away in a gorgeous setting. The location is as perfect as you can get! It's located just steps from the Quick Silver ski lift and you can walk to the most popular restaurants and shops on Main Street. Yet, the unit is peaceful and quite as it occupies a corner of the concrete building. You do not need a car when staying at this location yet reserved parking for two cars is available. Will this be your first time in Breckenridge? Allow me to help plan a memorable vacation!! I can offer discounts such as; 30% off ski rentals (no need to carry skis to/from the Quick Silver ski lift) and transportation to/from Denver International Airport via a shuttle (no need to rent a car and be concerned about driving/parking). A four queen bed and three full baths unit located conveniently at the Base of Peak 9 for skiers, snowboarders and travelers wanting to walk to the Quick Silver Ski Lift and enjoy Main Street Breckenridge. A heated pool and four hot tubs awaits your families arrival after an enjoyable day on the slopes. This condo underwent a complete interior remodel. 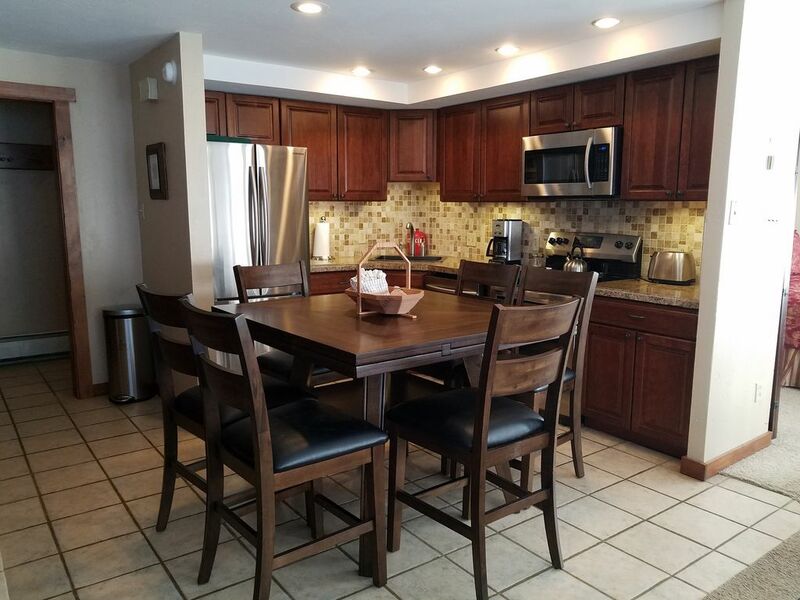 The remodel included a new custom cheery wood kitchen, new drywall ceilings/lighting, hand textured on all walls, new custom cherry wood vanities and sinks, new cheery wood doors throughout the unit, etc... feel free to call me for more information and availability. This corner unit is 1150 square feet with two bedrooms, three bathrooms, and three separate vanity areas. This versatile Condo appeals to large families or three (3) couples which each can have their own room. The layout provides exceptional privacy with one common entrance and three separate rooms, two of which have doors on them. Refer to the layout photo for room/bedding configurations. All three rooms have a HDTV. A 50" HDTV 1080P Smart in main room and each bedroom have 42" HDTVs. A spacious, wrap-around deck provides additional space to gather before departing to your favorite activity or use the gas grill for BBQ. Please see list of Amenities below. Sorry, Pets are NOT allowed and this is a NON-SMOKING facility. Other people have suggested that we might have gone overboard in our improvements for a 'rental unit'. But to us this is more than an investment property; it's our second home. Like you, we appreciate all the fine details and finishes featured in the new luxury developments in Breckenridge. If you are looking for a ski-in/out or smaller unit… scroll down to the section identified as ‘Links to More information’ and click on ‘See All My Rental Listings’. We have two smaller (2 - 6 people) ski-in/out units are located in The Village at Breckenridge 5 min walk away from this unit. My goal is to help you plan and have an enjoyable and memorable vacation in Breckenridge Colorado. I feel gifted to be able to live in what my father calls 'Gods Country' and want to share Colorado with you. If you call and the nights you are requesting are already booked... I will try to provide you information that will help you anyway. Location... Location... Location. A car is not required when staying in this unit. I own several properties in Breckenridge and have been serving guests since 2002. I am very involved with Breckenridge holding a variety of Home Owners Association positions / volunteer work. toilet, combination tub/shower, Vanity located seperate from bathroom. More versitality. toilet, combination tub/shower, jetted tub, Vanity located seperate from bathroom. More versitality. All towels, linens, disposable paper products and soap provided. 3 washers and 3 dryers are shared. Reserved parking for two (2) cars included. RV and trailer owners discuss with owner. 8 bath towels, 8 hand towels and 8 wash cloths. 42" HDTV, sofa and loveseat. White water rafting, kayaking. Contact owner. Heated pool. Available at Columbine Recreation Center. 40 yards from unit front door. Four hot tubs at Columbine Recreation Center. 40 yards from unit front door. We had a very enjoyable trip to Breckenridge. It was easy to get to the condo, easy to access and Scott was very accommodating. The condo was clean and had enough room for 4 adults and 2 kids. We had everything we needed and it was very well situated close to the ski area and local restaurants and bars. We had an awesome trip. I would stay in his property again. Perfectly set between the lifts and Main Street, we very much enjoyed our stay. Plenty of space and sleeping quarters for the 3 of us. Very clean, very comfortable. Scott did a great job of making instructions easy and checking in as well to make sure all was well. Great location, solid no frills condo! Proximity to the village at peak 9 is great, we were 4 adults with 3 kids 7yrs and under all skiing, and they all make the 5 minute walk daily, only minor complaints from kids at the end of the day for having to walk back after a tiring day of skiing. Good parking, condo is on main level (1 flight of stairs). Easy access (keycode). Beds and couches are comfortable. Plenty of bathroom space. Kitchen is stocked well with dishes, only suggestion would be to add some basic missing utensils and better cookware. Fireplace is a perfect place to dry gloves in no time, timer feature is great. Only suggestions would be to add some basic missing/better kitchen utensils, slightly better cookware, extra sleeping pillows, and working humidifiers. Scott is a great host, very responsive, pleasant, and informative. Had a great time staying here with my brother in law and our 3 (grown) boys. The 4 beds, 3 baths and comfortable living/dining space fit us very well. We got 3 feet (!) of snow while there and the views even of the adjacent neighborhood through all the windows and wrap around porch of ‘this end unit were amazing each morning. The unit is a first floor with only a half flight of steps up (over the garage) to get to the front door. The walk to the Quicksilver Superchair is across the parking lot, thru some common ground between condos , down a small hill and across a short foot bridge. It took maybe 5 minutes and in the snow it looked like a nature walk thru the trees. A real key is to use Scott’s discount to rent your skis at Breck Sports at the Maggie building which is right at the Quicksilver lift. 100% worth renting here! Everyday we skied right up to the building, popped off our skis, took them inside and they store them overnight (nice and warm), ncluding poles and boots (which they’ll help you get on and off by the way, thanks Marita!). They hand you back your hiking boots/shoes (which they’ve stored while you ski) and the walk back and forth to the condo is easy. (That small hill down from the condo does take a.bit of effort uphill, but in regular shoes/boots it’s not bad at all). We even did this swap out when we came back to the condo for lunch. Very convenient, trust me, it’s the way to go. Walking to the village at the base of Peak 9 was even easier. We had so much snow we didn’t really realize how close the village was until we discovered the cut through that folks were taking. Rather convenient to several spots in town. It was a pleasure working with Scott before and during the trip. He had great advice (including ski rental options) and was always accessible when we had a question or need of something like a lightbulb replaced (promptly taken care of the next morning). All in all a great time and I’d recommend this unit and owner highly. Thank you so much for sharing your experiences! I will stop by Breck Sports and pass on appreciation to Marita this friday. Scott was wonderful to work with. His unit served our purpose quite nicely. Access to the slopes for skiing was easy the weather cooperated with good snow. We had a great week. Short walk to quicksilver lift and Main Street. Working humidifiers would’ve helped. Two new humidifiers will be placed in the unit by the weekend. Always feel free to let me know what I can do to make your stay more successful. Thank you for sharing your experience and hope to hear from you on your next trip to Breckenridge.